This guide will walk you through troubleshooting email problems with Samsung Galaxy Note 2 SGH-I317 (AT&T variant). Use this guide if you are using any of these e-mail types POP3, IMAP, or Corporate account. Follow the steps below to check if you have an Active Internet Connection first. Check the data coverage indicator. Ensure that flight mode is disabled. Power cycle the device and Check SIM (if applicable). If NO icon is present, contact the carrier to determine if there is a network outage in the area. If the indicator is present, proceed with troubleshooting the type of protocol you are using below. Check to see if this is the only device that is configured to receive email. Verify login credentials by logging on using webmail through a browser from your device. Send a test message from webmail and verify that the message was sent and/or received. On the mobile device, verify incoming and/or outgoing server settings using the credentials you just used on webmail. Send a test message from the device to the same address used in step 3. If you are still not able to send and/or receive the message, click below for step to Reset Email Application / Clear Data for email account(s). Check to see if the sync feature is enabled for Email. Ensure proper sync settings are configured. Try manually syncing the email account. If you are still not able to send and/or receive the message, click below for steps to Reset Email Application / Clear Data for email account(s). NOTE: The following steps will reset all email accounts on the device. If you are still not able to send and/or receive email, contact your company's IT department for further assistance. 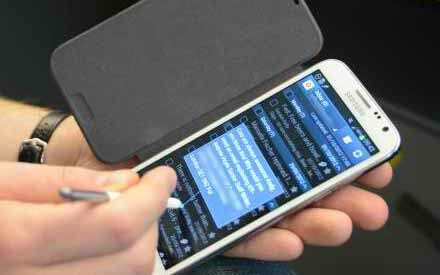 If you other problems with your Samsung Galaxy Note 2, feel free to email us at sebertech@gmail.com.